This post is sponsored by B&W Quality Growers, the world’s largest grower and marketer of watercress. Eating a plant-based diet will improve your health. Plant-based diets are associated with lower rates of heart disease, metabolic syndrome, type 2 diabetes, certain cancers, and better cognition (1,2,3,4). Data from vegetarians suggests plant-based diets might also be associated with a longer lifespan (5). If you love dairy or meat, you don’t have to give up either to benefit from a plant-based diet. But you will benefit from adding more plant-foods, particularly leafy greens like watercress for a healthy body and mind. Fortified with more than 18 essential vitamins and minerals, watercress is the healthiest leafy vegetable on the planet as it is high in water content, a naturally low calorie and low-fat food. It’s also one of the most nutrient-dense vegetables in the world, earning perfect score on the Aggregate Nutrient Density Index (ANDI) nutrient density scale. Plant-based means the bulk of your diet comes from plants. Fruits, vegetables, nuts, seeds, whole grains and legumes (beans, peas, lentils and more) are the staples of a plant-based diet. Eating plant-based does not mean you never eat dairy, eggs, meat, fish, or poultry. However, these foods do not make up the bulk of your diet when you are eating plant-based. How does a Plant-Based Diet Lower Disease Risk? Plant foods are all not only full of vitamins, minerals, carbohydrates protein and healthy fats but they are also full of fiber and phytonutrients. Most Americans get half the fiber they need each day for good health. In addition to helping support digestion and preventing constipation, fiber feeds the good bacteria in our gut. The health of our gut depends on the diversity and type of bacteria that live there. Also, most of our immune system is in our gut making gut health important for immune health and, because of the gut brain axis (the gut and brain talk to each other), brain health. Gut health is quickly becoming a hot topic as scientists learn more about the importance of gut health every day. As part of the MIND diet, leafy greens are linked to a lower rate of cognitive decline. Watercress is a cruciferous vegetable, which are generally known as cancer-fighters due to their high levels of phytochemicals known as isothiocyanates. A growing body of evidence suggests watercress earns its “superleaf” title because it may help prevent the spread of cancer cells (6,7). Plus, it is a good source of vitamin A, an essential vitamin necessary for normal vision, skin health, and maintaining immune function (2). Watercress is also high in the antioxidant vitamin C, which protects the body against free radicals. Vitamin C also supports the normal function of blood vessels, healing of wounds, iron absorption, and neurological function (3). 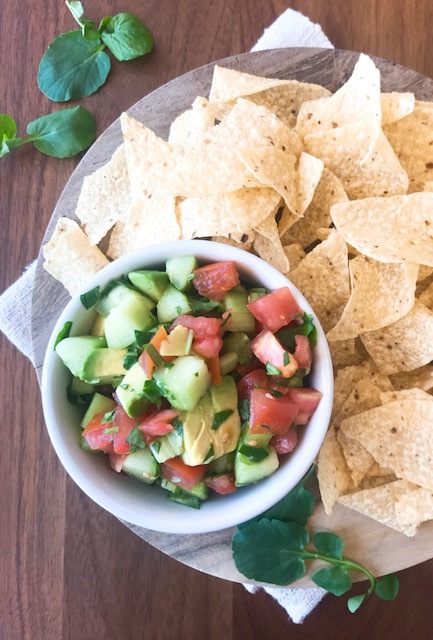 – Try my favorite snack: watercress salsa along with lentil or bean chips. – Spread avocado mash on a piece of higher fiber toast (my favorite one is made from almond and sweet potato flour) and top it with watercress, feta and a drizzle of balsamic glaze. – Make broad bean or garbanzo bean chips. – Dip celery or carrots in peanut, almond or another nut butter. – Make my favorite salad: Watercress, pear, fig and goat cheese salad. 2. Try different forms of plant-based foods. There are many forms and ways to cook each plant-food! – Lentil or bean pastas are a fantastic substitute for regular pasta. – Split pea soup vs. peas. – Brussels sprouts cooked with turkey neck vs. roasted and crispy. – Top cauliflower with avocado oil and parmesan cheese and roast it. – Boil red potatoes and add olive oil and dill after cooking. 3. Make your dessert fruit and nut-based. Fruit is available all year long. From watermelon in the summer to pumpkin in the Fall, there are many ways to enjoy fruits for dessert. I like pairing plain Greek yogurt with berries or grapes and a sprinkle of granola. 4. Add greens to your smoothie. Use greens like watercress to enhance your favorite fruit smoothie. This is the perfect way to get more greens in your diet. My favorite smoothie includes 8 oz. 100% orange juice, a handful of frozen watercress (any time I can’t use a fruit or vegetable in a timely manner I freeze it), frozen mango, ginger and vanilla or unflavored whey protein powder (an amount that contains 30 grams of protein). 5. Add vegetables to your main dishes. – Chopped mushrooms and onions work well in beef or turkey patties. – Add veggies to your kabobs. Try grilled veggie and meat (or tofu, which is made from soybeans!) kabobs. – Top your pizza with sliced tomatoes, broccoli, onions, peppers and mushrooms. – Chili is a great staple for the winter and naturally loaded with beans and diced tomatoes. In a large bowl, combine all ingredients. Serve immediately with tortilla chips. 1 McMacken M, Shah S. A plant-based diet for the prevention and treatment of type 2 diabetes. J Geriatr Cardiol 2017;14(5): 342-354. 2 Kahleova H et al. Cardio-Metabolic Benefits of Plant-Based Diets. Nutrients 2017;9(8): 848. 3 Lanou AJ, Svenson B. Reduced cancer risk in vegetarians: an analysis of recent reports. Cancer Mang Res 2011;3: 1- 8. 4 Hardman RJ. Adherence to a Mediterranean-Style Diet and Effects on Cognition in Adults: A Qualitative Evaluation and Systematic Review of Longitudinal and Prospective Trials. Front Nutr 2016;3: 22. 5 Orlich MJ. Vegetarian Dietary Patterns and Mortality in Adventist Health Study 2. JAMA Intern Med 2013; 173(13): 1230-1238. 6 Gill IR et al. Watercress supplementation in diet reduces lymphocyte DNA damage and alters blood antioxidant status in healthy adults. Am J Clin Nutr 2007;85(2): 504-510. 7 Boyd LA et al. Assessment of the anti-genotoxic, anti-proliferative, and anti-metastatic potential of crude watercress extract in human colon cancer cells. Nutr Cancer 2006;55(2): 232-41. Is TMAO from Fish, Meat and Eggs Harmful? In another confusing nutrition story that should be titled “is there anything left for us to eat?” recent research threw a curveball. 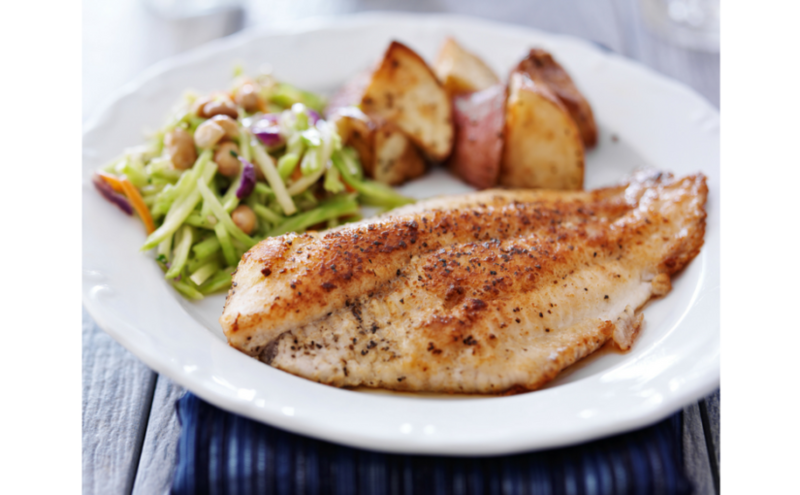 Fish, a staple of the Mediterranean diet, as well as meat and eggs may be doing more harm than good thanks to a compound called trimethylamine-N-oxide (TMAO). TMAO is found in fish and produced in the body after eating meat and eggs. TMAO is linked to greater risk for heart attack, stroke and death; yet the research isn’t crystal clear. Is it time to give up fish meat and eggs or ignore the recent media headlines? TMAO: More than a Gut Reaction—What gives us higher TMAO levels? Blood levels of TMAO are ~ 50 times higher after eating fish compared to eggs or beef. The human body absorbs intact TMAO like the kind found in fish, easily. However, the human body’s production of TMAO, after eating foods containing the essential nutrient choline (found in eggs and meat) and the compound l-carnitine (found in meat and pork and in much smaller quantities in chicken breast and dairy products), depends on the makeup of bacteria in your gut, kidney functioning and genetics. In one study, regular meat eaters produced more TMAO than a vegetarian did after eating steak (which contains ~ 180 mg of l-carnitine). After wiping out their gut bacteria with antibiotics, the carnivores didn’t produce any TMAO after consuming 250 mg l-carnitine. The makeup of gut bacteria in the habitual meat eaters was presumably responsible for greater TMAO production compared to the vegetarian, yet this was a small study and we don’t know anything else about the participants’ diet. Was it the meat that altered gut bacteria or something else in their diet? After all, a steady diet of red meat may mean double cheeseburgers on white bread with regular servings of French fries and soda on the side. This isn’t exactly the diet you want for promoting good bacteria in your gut. Another study found blood levels of TMAO were greater in those with a less diverse makeup of microbes and greater amounts of a less healthy type of bacteria (firmicutes), compared to one that is healthy (bacteroidetes). A diet higher in saturated fat will promote this environment. While bacteria seem to influence TMAO production from l-carnitine, l-carnitine also influences the makeup of gut bacteria. A study in mice found those with their gut bacteria wiped out thanks to antibiotics produced a different makeup of bacteria in the gut after consuming l-carnitine while also doubling the risk of plaque buildup in their arteries. A few human studies found higher blood levels of TMAO were associated with greater risk for heart disease. However, all research isn’t pointing in the same direction. One study in over 300 patients found blood TMAO levels were not associated with heart attack or heart disease over the course of eight years, following the initial test for TMAO. However, TMAO levels were higher in those with diabetes, patients with metabolic syndrome and those with declining kidney functioning. Another study examined over 800 people between the age of 33 and 55 and found blood TMAO levels were not associated with clogged arteries, insulin resistance (this comes before type 2 diabetes) and inflammatory markers or negative changes in blood lipids suggesting TMAO levels might not contribute significantly to the progression of clogged arteries. However, this study shows TMAO levels were significantly lower than in previous research, showing an association between TMAO and heart disease. TMAO is considered a risk factor for cardiovascular disease. In those with type 2 diabetes, higher TMAO levels are associated with greater risk for death, heart attack, heart failure and unstable angina (chest pain). Also, higher levels of circulating TMAO are associated with higher risk of death in those with chronic kidney disease and greater risk of certain cancers. Yet, there are several confounding factors. Fish is the primary culprit for higher acute circulating TMAO levels, yet fish-based diets are associated with reduced risk for heart disease. Also, levels of TMAO are dependent upon disease state and the makeup of gut bacteria. Therefore, at this time it isn’t entirely clear which came first – does TMAO cause disease or does TMAO increase due to disease? The story on TMAO isn’t crystal clear, so there’s no reason to avoid fish, meat and eggs in an effort to decrease TMAO levels. All three of these foods are good sources of several nutrients important for health. Though processed red meats are linked to higher risk of colorectal and stomach cancers, when cooked appropriately (lower, moist heat for example) red meat can fit into a healthy diet and deliver important nutrients including iron, zinc and vitamin B12. Eggs are an economical source of protein and contain many nutrients and compounds that contribute to health including two antioxidants important for eyesight. Though there is no reason to completely avoid these foods, you can alter your diet to help diversify gut bacteria and also increase the amount of good versus bad bacteria. Probiotic rich foods such as yogurt and kefir with live and active cultures, miso soup, tempeh and other fermented foods contain good bacteria. Fiber-rich plant foods (fruits, vegetables, legumes) are important food sources for bacteria to thrive in your body. Disclosure: this post was sponsored by USFRA. All views are my own and backed by research. Koeth RA, Wang Z, Levison BS et al. Intestinal microbiota metabolism of l-carnitine, a nutrient in red meat, promotes atherosclerosis. Nat Med 2013 Apr 7. Cho CE, Taesuwan S, Malsheva OV, Bender E, Tulchinsky NF, Yan J, Sutter JL, Caudill MA. Trimethylamine-N-oxide (TMAO) response to animal source foods varies among healthy young men and is influenced by their gut microbiota composition: A randomized controlled trial. Mol Nutr Food Res 2016 Jul 5. Mueller DM, Allenspach M, Othman A, Saely CH, Muendlein A, Vonbank A, Drexel H, von Eckardstein A. Plasma levels of trimethylamine-N-oxide are confounded by impaired kidney function and poor metabolic control.Atherosclerosis 2015;243(2):638-44. Meyer KA, Benton TZ, Bennett BJ, Jacobs DR Jr., Lloyd-Jones DM, Gross MD, Carr JJ, Gordon-Larsen P, Zeisel SH. Microbiota-Dependent Metabolite Trimethylamine N-Oxide and Coronary Artery Calcium in the Coronary Artery Risk Development in Young Adults Study (CARDIA). J Am Heart Assoc. 2016 Oct 21;5(10). pii: e003970. Posted on December 23, 2016 December 23, 2016 Categories nutritionTags antibiotics, atherosclerosis, bacteria, Blood, blood lipids, cardiovascular disease, carnitine, carnivore, chicken breast, choline, clogged arteries, CVD, dairy, death, diabetes, eggs, fiber, fish, genetics, gut bacteria, heart attack, heart disease, insulin resistance, kidneys, l-carnitine, meat, metabolic syndrome, microbes, pork, prebiotic's, probiotics, processed red meat, red meat, stroke, TMAO, vegetarian6 Comments on Is TMAO from Fish, Meat and Eggs Harmful?